25' high-definition cable with gold-plated connectors. 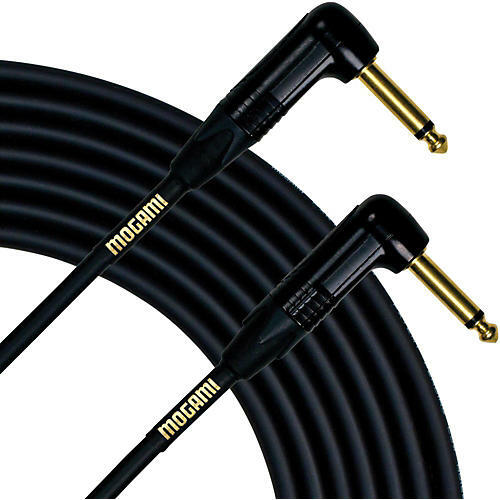 This Mogami high-clarity, high-definition, 25' instrument cable is for players who need 90 degree connections on both ends. Gold 1/4" phone plugs. Mogami guitar cable allows uncommonly clear, accurate, transparent tone, with dead silent background. Since research has shown that many guitarists actually prefer to move around while playing, they use carbon impregnated PVC as an additional shield layer to eliminate any handling noise. Use for any unbalanced instrument, pedals, patching, etc. Mogami has been revered by audio professionals for almost 50 years. It is undeniably a standard in music recording and post production facilities worldwide. Until now, Mogami was only available to professionals and then only in large bulk quantities. Finally, the world's best cable is available pre-wired, for all live performance and music recording applications.